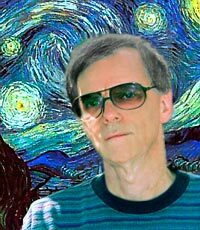 I have almost completed a makeover of my primary website, enochsvision.com. The previous design was five years old. I felt that it had a few problems. One problem was the design’s image pop-ups. Firefox with the popular Tab-Mix add-in displayed the enlarged images in a new tab. Thus the navigation graphics disappeared and the image itself looked out of place. Some versions of Internet Explorer failed to show the image pop-ups at all. I also felt that there was too much black on the image pages. Many photographers use black backgrounds –as I continue to do– because black makes a photograph’s colors appear more vivid by contrast. I have also added new images that weren’t included in the previous design and an entirely new media, collages. There are also two newly scanned portraits of my favorite fictional character, Hannah Moon Light, who is the heroine of some of my stories. See my page about the name The name Enoch and Portraits of the Artist (who is enochsvision?). I will soon add two animated Flash movies of many of my bird images and a new section called Meditations. Many of the meditations are drawn from this blog but are considerably expanded. Please use the Feedback form on my website to let me know what you think of it and to offer any suggestions on how I might improve the user experience. I thoughtfully consider all constructive suggestions. 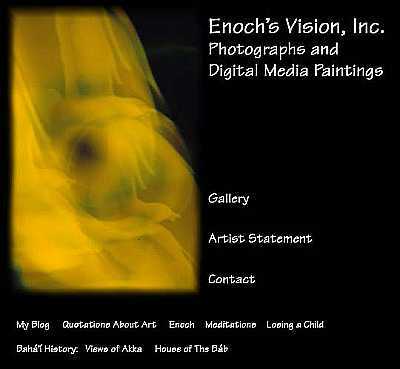 enochsvision.com is what I call a Bahá’í-inspired or Bahá’í-themed presentation. It is purely a personal site maintained by me, an individual, whose purpose is to teach people about the faith that gives meaning and purpose to his life. Bahá’u’lláh, the Prophet-Founder of my faith, inspired believers to strive for excellence in all things. I have not achieved excellence yet but always continue to strive for it. Download a document in PDF format titled “excellence-in-all-things” which was compiled from the Bahá’í Writings by the Universal house of Justice in Haifa.